Whew! What an exciting, exhilarating and exhausting few months! I finally find myself on the far side of my first two wholesale show, so I'm taking a few moments to sit back and analyze where I've been and where I want to go next. In January, I attended the Buyers Market of American Craft (BMAC) in Philadelphia (now renamed American Made Show). Last week, I participated in the expanded wholesale section at the American Craft Council (ACC) show in Baltimore. I was so much more relaxed with the first show under my belt! I shipped most of my booth directly from one show to the next, so I was able to complete my set up with the addition of two checked pieces of luggage (one of which weighed 90 pounds!). Although there was some overlap in the attendees at the two shows, overall I felt I reached a different audience with the second show. The show layout was confusing and obviously a last minute addition which didn't work as well as being down on the regular show floor would have, but even so I wrote a few orders and made some good contacts. One of the best parts of doing such shows is meeting other artists. I am truly grateful for the camaraderie shared amongst vendors at these shows. Over the course of a few days, we become good friends and share tons of helpful information. I feel blessed to have such fun neighbors, who watched my booth for restroom runs, brought me drinks, offered chocolate, and kept me amused during slow spells. Now that I'm home, I'm compiling data on what sold and what didn't to use in refining my collections going forward. 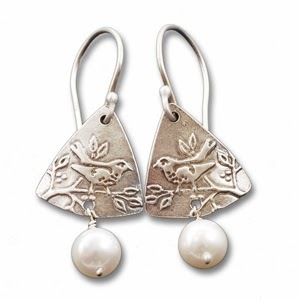 The bestsellers were from my flock collection, including the wren earrings shown above and a coordinating necklace. This collection is based on a series of my original drawings, converted into raised textures on sterling silver. I have quite a collection of sketches, and the spring bird migrations are coming to inspire more, so I'm busily thinking of new designs to expand this collection. Your booth looked beautiful. I noticed you didn't do foamcore walls at this show. What was your final thoughts about booth walls? Was the foamcore worth it? Evelyn, I couldn't get foam core delivered from the local art store in Baltimore. A few artists there did use foam core, but they had it shipped in. I decided to try just using the white drapes provided by the show, with new aqua accent panels. That worked fine. I don't think the foam core is very difficult, and I love the look, but I don't know that it really impacts the buyer that much. At the end of the day, they are looking at jewelry. There's a certain level of presentation that needs to be met, and after that I think my work going forward will focus on jewelry. If foam core is easily available, I might do it again. If not, I won't worry about it. I found your beautiful booth during a google search for jewelry booth design and love the lighting you have used! I have been concerned about clamping lights onto the pipe and drape as you have done here because of stability. Do they not slide around with the fabric under the clamp? This lighting set up is what I have in mind and was curious if I needed to find another way to light my booth. Sorry for not seeing this comment for so long. Somehow, I never got a notification? Yes, the clamps will slide around if you put them on top of the drapes. The drapes are usually in panels, and I just try to space them so that I can put the lights between.